As lawn maintenance professional, you want to continuously improve your business every single day. It can be tough working on your business when you feel like you’re always working in your business. Lawn maintenance professionals are busy folks! There are quite a few online resources for any business owner - the information ranges from finance, operations, marketing, sales and just general day to day management. One resource that is specific to the green industry is Lawnsite.com. Lawnsite is filled with useful information for all green industry professionals. However, it can be tough to navigate at times. 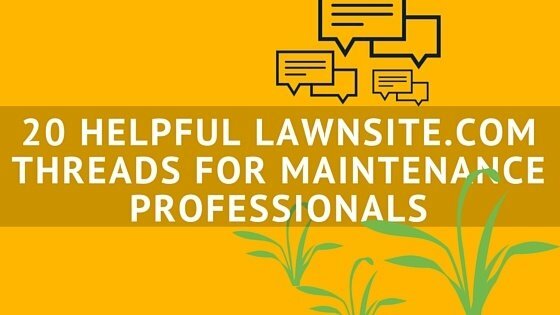 So, we picked out twenty of the best Lawnsite.com threads that all lawn maintenance professionals should check out that can help improve their businesses. This is a great thread to read if you’ve ever considered partnering with other local businesses that provide services that your lawn maintenance business doesn’t. There are tips on how to handle sending referrals to other businesses, how to initiate contact with other businesses you’d like to partner with and also why you might not want to even partner with other businesses. It is tough to turn down business, but there are times when it might be better off for your business to turn a potential customer away. In this thread, there are stories of some warning signs that you might see when you give a customer a quote. Many of the Lawnsite users on this thread share advice about how to handle situations that might not be a great fit for their business. 3. What to do about cheaters? Here is a great thread about what you should do when your competitors in your area are unlicensed, dirt cheap and seemingly stealing business from you because they are beating you on price. The initial question on this thread asks what to do about the “Joe Schmoes that come out of the woodwork every spring? No license, insurance, taxes. I'm talking about the guys with a hoopty pickup truck, lawn boy and a weed whip”, that essentially are taking business from you. The first response says that you should not bow to price, which is great advice considering that value-based pricing can be a more successful strategy for lawn maintenance businesses. Unfortunately, this is a reality that many lawn maintenance businesses will face. A customer might feel that they were cheated on a job or they might just flat out refuse to pay. Some great advice on what to do and what your options are as a business. 5. To better my business, do I need a degree? Some great advice from seasoned vets in the lawn maintenance field. There are Lawnsite users that offer up opinions on both sides of the debate on whether or not you should pursue a degree in order to better your business. This thread is about how to go about purchasing a customer list from another contractor. The users on this thread share advice about whether or not you should do so and about how you can grow your own customer list organically each year. Here is an eye opening thread! Lawn maintenance pro’s share what their employees are producing for their business annually and how much revenue each employee needs to produce in order to make a business profitable. Some of the users on this thread are highly analytical on this topic and go into depth on whether or not you should focus your efforts on other services other than lawn maintenance. Used equipment can often be a gamble. It might save you money at first, but could cost you in the long run. On this thread, users share their opinions on whether buying used can pay off. 9. How do you get referrals? This question was posted in the Starting a Lawn Care Business section of Lawnsite, however, there is advice that any lawn maintenance professional could use for their business. Referrals continue to be one of the top forms of lead generation for the green industry, so it is important that you continuously generate new referrals from your existing customers. Coming up with a business name can be tough to do. This thread was started off of the question of whether or not the person posting should change his business name. Essentially, someone a couple cities over had a similar name as his business and was threatening him to change his name. There is some good general advice about naming a business and what you can do if another business is trying to use the same DBA that you are currently working under. Subcontracting out labor can be an efficient way to make money. However, there are quite a few concerns that can arise. This thread covers things such as management of subcontractors to whether or not you should allow your subs to wear uniforms with other companies logos on them when on a customer’s property. This is a great thread about what to do if one of your superiors are being dishonest about their work. There are times when you younger, less experienced crew members get pinned with the blame for issues that they didn’t cause. This discussion is great for those that have been in that situation and also for managers who know that this might be the case with some of their crews. While the title of this thread made me laugh, there is some awesome advice about what to do when you just have an employee that has a personality that you clash with. It will happen eventually. The question was posted by an owner who was getting annoyed by an employee who was great at the job, was able to perform the work he was asked to do, but just wouldn’t stop talking! If you’ve ever been in this position as an employer, you know how difficult it can be. While it might not be the easiest thing to do, having to ask someone the hard question of whether or not they can change their behaviors or face being fired can be necessary for the health of your business. Search engine optimization for lawn maintenance businesses can be tough. Typically, there is quite a bit of competition in most geographic areas. However, there are some things that you can do well to get your website ranking in those coveted top three positions. This thread covers some of the things you can do to get your site ranking a bit higher. Yelp and other local search directories can be a large source of leads. But they can also become a large source of headaches. This thread goes over what you can do instead of paying a large amount for Yelp advertising and how you can still generate positive reviews for your lawn maintenance business. In a nutshell, should you create them, how should you create them and who do you send them to? E-Newsletters can be an awesome way to promote other services to existing customers and a great way to reach prospects. This thread covers what you need to know. Choosing the right mower is an extremely important decision that you need to make, but with so many options on the market, which one is right for you? This thread covers what you need to look for in a good push mower and some great recommendations that you should consider next time you’re in the market for a push mower. Great information on the tire pressure you should be running your mowers at. If you have issues with uneven cuts or far too bumpy of a ride, this thread is for you! Everything you need to know about blade types, sharpening and maintenance and other factors you should consider in order to get that perfect cut from your mowers. Now that you're following some of the most helpful forum threads, why not learn more about how lawn maintenance software can help your business. Sign up to learn more about FieldCentral - the easiest way to take control of your business. Just click below!